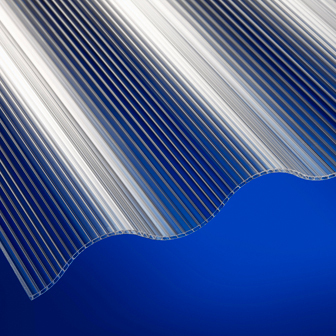 This light weight corrugated roofing and cladding sheet has a twinwall structure for enhanced spanning capability. It combines the durability and resilience inherent in polycarbonate with the added strength and rigidity provided by a twinwall structure. Co-extruded UV protection provides resistance against the effects of weathering. Available in 3" Iron profile. Ensure correct accessories are chosen to match sheet profile. Clear sheet provides a high natural light transmission of 79%. Corolite CST polycarbonate is manufactured under BS EN ISO 9001:2008 Quality Management System.